Sleeping sickness-causing parasites contain an unusual protein synthesis mechanism. A team of researchers from ETH Zurich and the University of Bern have resolved its very special structure for the first time. Ribosomes are among the most important molecular machines within the cell, and have hardly changed in the course of evolution. Their function is to read copies of our genes, or building plans, and to translate them into proteins. Research groups from ETH Zürich and the University of Bern, with financial support by the Swiss National Science Foundation, used electron cryo-microscopy in order to obtain the atomic-resolution structure of a very unusual ribosome present in the mitochondria of Trypanosoma brucei, the unicellular parasite that causes sleeping sickness. Their study appeared in the latest issue of Science. Mitochondria are organelles that can be found in each eukaryotic cell. They are the power plants of the cell and contain their own mitochondrial ribosomes (mitoribosomes). They produce a number of proteins that are essential for these power plants. The mitoribosomes of trypanosomes have the same basic function as ribosomes from other organisms. However, they are specialized for the biology of trypanosomes, and their structure deviates substantially. All ribosomes are composed of two types of components: ribonucleic acid (RNA) and proteins. Intriguingly, the researchers found that mitoribosomes of trypanosomes are larger than any other ribosomes, including the ones found in humans. "The mitoribosomes of trypanosomes are primarily build up by proteins, whereas the structure of other ribosomes is dominated by RNA. 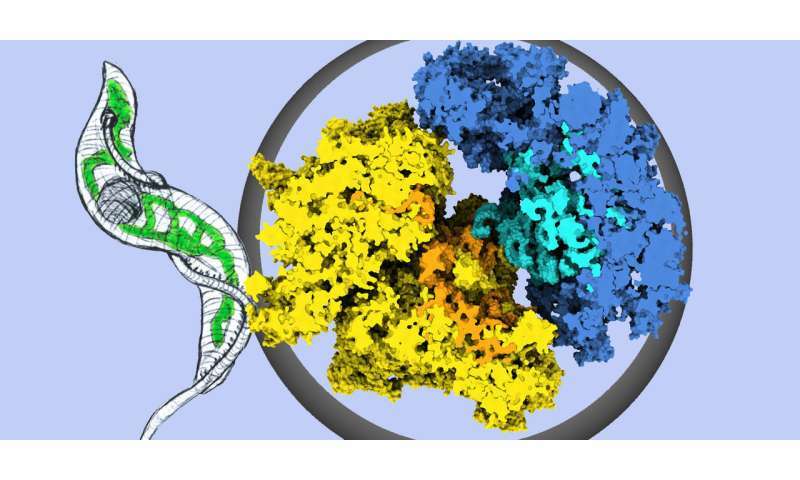 Consequently, in trypanosomal mitoribosomes, proteins took over the architectural role of the RNA building blocks," says ETH professor Nenad Ban. In analogy, a small wooden house would differ from a big concrete construction, but both would need a roof, stairs, windows and so on. "Furthermore, the comparison between the protein-dominated mitoribosomes of trypanosomes with the RNA-dominated ribosomes of other organisms allows us to better understand the most basic functional elements and building blocks shared between all ribosomes," Prof. Ban explains. Amazon Surpassed Bill Gates this years. Ribosomes collected from all organisms should surpass Amazon too. Just Get 1 Universal DNA to order those Ribosomes !